I call PHYSFS_init it return 0 (so there is an error) but the PHYSFS_getLastError() is empty. 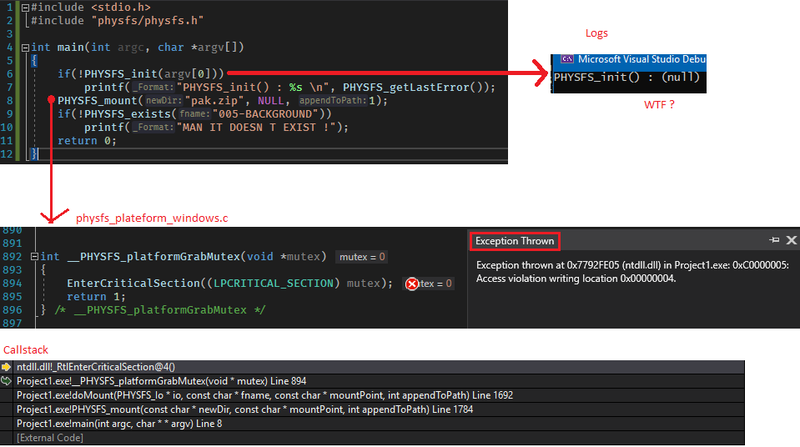 When my program call PHYSFS_mount I get an exception thrown (if the lib is not init it seem normal). This is probably not an SDL issue but I will try assist. Are you passing arguments into vs2019 when you run your program. I am not sure how this works in vs2019, but I reckon this is your issue. You have not passed any arguments or using arg would be wrong I think. I tried outside the IDE with custom argument but it’s still the same. I tried with NULL too and it has the same behavior. 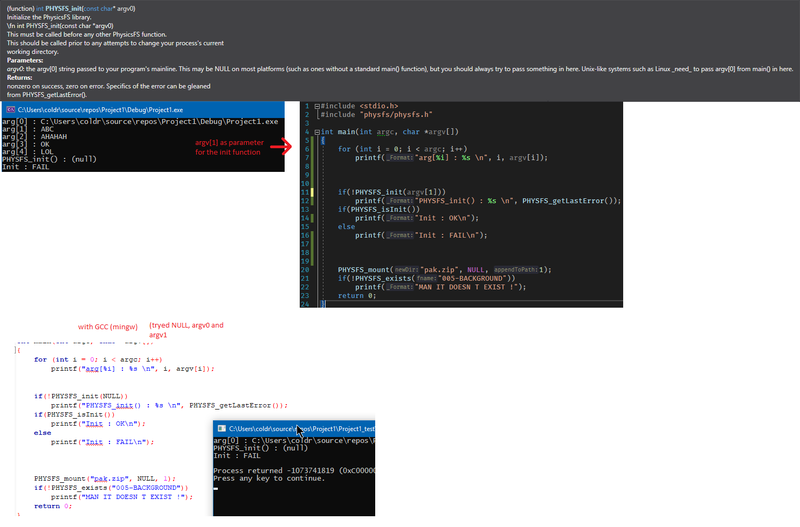 My project in VS2019 doesn’t have argument while debug but argv should be ok.
Did you try with arg outside the IDE with custom argument . I tried with argv but I don’t understand why. The init really wait argv (probably to know where it is). I tried inside IDE, outside IDE, with GCC (mingw). It seems args is to be passed according to the documentation. NULL can also be used it seems also. counted on a specific language, since some were dynamically generated. So I would try using PHYSFS_getLastErrorCode() and see what you get. with a debugger and see what’s happening. So in fact the “UserDir” was empty so it lead to an abort of the init. The call of the function" rc = pGetDir(accessToken, &dummy, &psize);" to optain the &psize fail and lead to a psize = 0 so the next pGetDir fail too and the return value is 0. So to get it work because I don’t know what to really do, and what the library wait for return value (my user directory ?) I made a little workaround and it work but it’s hardcoded. just make psize = MAX_PATH. I added *2 because there is workaround in windows to get double of the path limit so i prefer to double it here. So I looked in the mercurial and it already have a commit for that : https://hg.icculus.org/icculus/physfs/rev/ece6769c0676 and it is not included in the file provided in the “last” version 3.0.1 so I didn’t minded that there could be one. The fix is that it doesn’t use a dummy but directly NULL (and I should have tried with that). Yeah, sorry, Microsoft broke that API in Windows 10. We’re going to do a PhysicsFS 3.0.2 release eventually to deal with that. Also note that the second parameter can’t be NULL or the function fails. Either I misread the docs 18 years ago, or this detail was changed in newer revisions. It definitely accepts NULL back to at least Windows XP, though. It’s 100% possible I was coding defensively for Windows 95 users, which were only six years old at the time. As a followup: I tested this, and it definitely does not accept NULL on (at least 32-bit) WinXP. It wasn’t an issue on Win9x, since this API didn’t exist there. Microsoft made this work with NULL at some point (and broke the legit way you were originally meant to use it in WinXP times, too) and quietly changed the documentation.